Read some of the comments and feedback we’ve received across the years. We strive our best to provide a quality product and knowledgeable customer service. We know we can’t fully satisfy everybody and if for any reason you’re not happy or something doesn’t work out, please tell us about it. However, if you’ve been well served and want us to know about it, please send us a comment and we’ll likely post it here. Our backyard has always been a getaway for relaxation and fun. The purgola we purchased through Tussey Mountain Mulch was the best addition ..putting the finishing touch on our pool area. It is a great spot for guests to hang out at a party and our favorite spot during a hot summer day to escape the sun. Everyone at Tussey Mountain Mulch has been extremely helpful during the buying and building process. We highly recommend them to anyone wanting to enhance there outdoor decor. You can count on Tussey Mtn. for a job well done! I have purchased mulch from Tussey Mtn Mulch Landscape Center a number of times, both in bags and by bulk delivery, and in all cases every aspect of the purchase was exemplary. The staff was friendly and efficient, and the product was delivered on time, in the right location, and with great care, and was of very high quality. I am a customer for life. The people at Tussey Mountain Mulch are always helpful and friendly. Whether we need a mountain or molehill of mulch, need pavers or stepping stones, have questions about caring for our pond, or want to add more fish to the pond, their knowledgeable staff is A-1 and ready to help. They always have great suggestions and have exactly what we need. Thank you Tussey Mountain! I really did not have a clue on how to install the pavers until I came to one of your demonstrations. Thanks for all your help with the instructions on how to install the pavers. Your employee's also were excellent and courteous at delivering the material and at helping me count the extra bricks that I returned. Overall it was a good experience and I would recommend other potential customers to you. You are so much more than mulch! Your Plantings and customer service are top shelf! 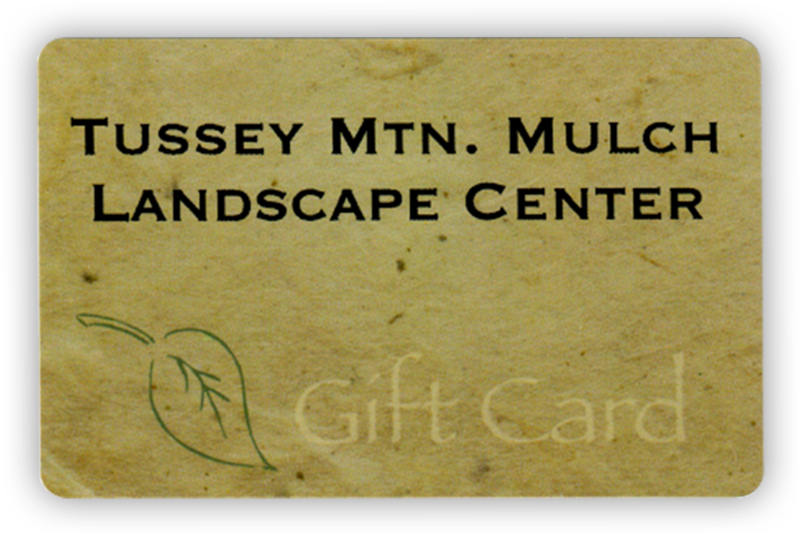 I have been a customer of Tussey Mountain Mulch Landscape Center for approximately four years. I have grown to really enjoy my trips to their beautiful landscaping supply center. They have a wide variety of stone and other mediums to choose from as well as pond supplies and a nursery. Their staff is always ready with a smile to help in any way they can. I appreciate their very professional attitudes and their knowledge of their products. It is always a pleasure to stop in and see what's new and different. Their location is easily accessible on a busy road and there always seems to be enough parking available. Thank you again for your help. We just want to say a big thank you for all of your help with our falls. We did a pondless waterfall project ourselves, and we had lots of questions. Anytime we called or would stop in to ask questions, you were very helpful and took the time to answer us. We were very appreciative of your courtesy and helpfulness. We would be safe to say if we had another outdoor project we would ask your help. Thank you again so much. We would recommend anyone with outdoor projects to talk with you.